From the NYT: "The Texas State Board of Education is again considering a science curriculum that teaches the 'strengths and weaknesses' of evolution, setting an example that several other states are likely to follow. This is code for teaching creationism." Are we really here again? I just don't get how people can call religion "science". Does it have a place in the classroom? Perhaps, as the Times article suggests, in Social Studies, but absolutely not in a class that is supposed to be based on empirical evidence. I am all for people embracing a faith that works for them, but if I had a kid in a school system that wanted to teach them creationism as opposed to evolution you can bet that I'd be pretty ticked off. Now then. 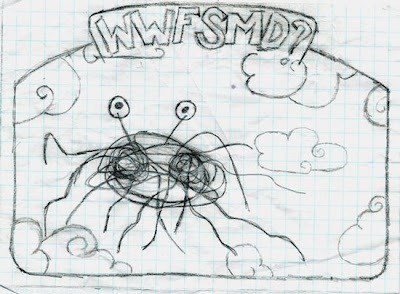 May his noodly appendages touch you all. Not exactly on topic (however, I completely agree)... I totally should have used noodly appendage for Diamond Dave. That is SO gross, MP. So. Gross. I agree with you, Kate. As a former science coordinator, I was thankful NY did not mingle anyone's religion with science. Districts certainly can try to stop teachers from teaching evolution, but it is pretty difficult. It's up to the churches to explain their way of looking at life, not to try to force their way into public education. Texas BOE drives the country, as they buy so many books, the text makers cater to them. Each state dictates what is required in the textbooks they purchase. Not everything is exactly according to the state curriculum, but they try to get it close. Science in NY is set by Hands on materials and concepts.